Third China Development of Dendrobium Industry Forum is being held in Kunming. Liyan-lan and other leaders are issuing letters of appointment to experts. The Third China Development of Dendrobium Industry Forum jointly organized by Dehong Government and "Yunnan Economic Times" and undertook by China Rural Economy Net and China Dendrobium Alliance was held in Kungming in the September 23. More than 150 people including Standing member of the Dehong CPC Committee Liyan-lan, experts from institutes of traditional Chinese medicine, chinese medicine hospitals, the institutes of Chinese medicine all over the country and principals of dendrobium processing, marketing, cultivation enterprises and bases for raising seedling attended the forum. Representative of Dehong CPC Committee Liyan-lan made speech at the opening ceremony. She introduced Dehong social, economic and cultural development and beautiful natural scenery, rich ethnic customs and development of dendrobium industry to experts and scholars from across the country. She said: success of the previous two development of dendrobium industry forum held in Dehong have strongly promoted the development of Dehong dendrobium processing, marketing and cultivation. Liyan-lan warmly welcomes both inside and outside province of powerful companies and businessmen to invest in Dehong, conduct various forms of exchange and cooperation, develop dendrobium industry and new production of dendrobium, enlarge and strengthen the dendrobium industry. In the two-day forum activities, experts from across the country made special statements on current medicinal study of dendrobium, tissue culture seedlings, new product development, the application of dendrobium, relevant national policies and so on. Principals of cultivation, processing enterprises interacted with experts about the dendrobium new product development and market expansion, cultivation management technology and dendrobium medicinal, health-care value. The forum caused the establishment of the Expert Group of Dendrobium Industry Development. 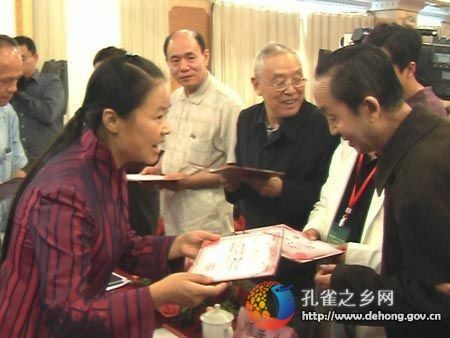 Liyan-lan and other leaders issued letters of appointment to the experts.